In 1933 a writer in the Kent Messenger noted that “Marden is no worse than any other village as regards church going, but it must hold the record for the number of churches and chapels in proportion to its population.” This all began in 1794 when the Rev John Andrews who was vicar of St Michael and All Angels, and presumably a man with strong protestant views, licensed a house for non-conformist ministers to preach the gospel. And so began a friendly relationship between the the church and the non-conformists in Marden. Sometimes the vicar, after giving his sermon at church on a Sunday morning, would go to the Congregational Church in the evening to hear the minister preach. The oldest Non-conformist church in Marden was given by Joseph Clout a local man. First built in 1804 it was completely restored in 1882. 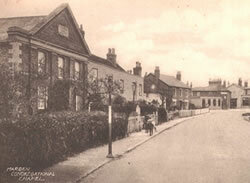 Pictured here in the Goudhurst Road, the Congregational Church grew until a bigger building was needed and the land adjoining was purchased by public subscription. The original building was then used as the Manse as there was a resident minister. The movement probably originated with Mr. Thomas Cornwell, the minister put in charge of Marden Church during the Commonwealth (1649 – 1660). After the Restoration he refused to take the Oath of Conformity and was deprived of his living. Many such ministers remained in their parishes administering to their followers, being known in those days as Independants. It is quite likely that Thomas Cornwell was one of these. The Congregational Chapel usually had a resident minister. The Rev. Samuel Raban, the Rev. Joseph Augustus Chamberlain, the Rev. Stephen Bater and Rev. A. T. Palmer were amongst them. The first minister was the Rev. W. Slatherne who came from Chatham in 1804. The Congregational Church still thrives today. 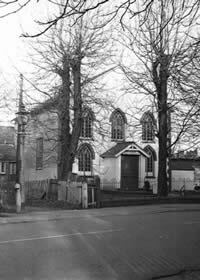 Opened on Wednesday, July 10 1845, on ground given by the Church, and supported by the Vicar of Marden, the Wesleyan Chapel stood at the top of Church Hill. Despite a strong following throughout the 19th Century there was never a resident minister. Visiting ministers came to preach from as far away as London. However by 1965 the congregation had declined to such an extent that they joined with the Beech Chapel and sold the building to the Church of England. The main building was demolished and the rear part restored in 1967 to become the present Vestry Hall. Further improvements have since taken place and the new hall was officially opened in 1999 by Archbishop Carey. The original chapel was built in 1848 and is believed to have had a thatched roof. The present building was built in 1868. 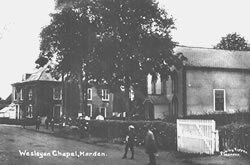 In 1932 the Wesleyans and the Primitive Methodists joined together as the “Methodist Church” but Marden continued to have 2 chapels until 1965 when the old Wesleyan Chapel in the village closed. With its larger congregation the Beech Chapel survived for longer, but has now been converted to a dwelling. In 1890, Henry Crowhurst and others purchased a plot of ground in Goudhurst Road, Marden, for the express purpose of building an Independent (Calvinistic) Chapel for Revd. William Lush (1835-1918) who had seceded from the Church of England in 1885 whilst Rector of Snargate with Snave. This was due to his being concerned about the increasing ritualism in the C of E. The Chapel was opened in 1891 and subsequently was vested in Trustees under a Deed dated 17 July 1894. William Lush continued to minister as Pastor of the Chapel until the end of June 1898, but for reasons unknown he then returned to the C of E and became Rector of Stretton-en-le-Field near Ashby de la Zouche. He had a son, William Dowland Lush (1871-1935), who having married into a Marden family (Honess), remained at the Chapel acting as Secretary until his sudden death in 1935 when he was buried in Marden Cemetery. From the time of William Lush’s departure, the services were conducted along Strict Baptist lines with mainly Strict Baptist ministers preaching and using a Strict Baptist hymnbook. However, because of restrictions in the Deed it never legally became a Strict Baptist Chapel. Derek and Tony Baldwin remember a large spacious building capable of holding some 200 people. The interior walls and steeply pitched ceiling were entirely clad in varnished pine, giving the place a somewhat sombre air. There was a vestry for the minister and another room to which the small congregation would resort on cold winter days. The service lasted about one and a half hours, with a great emphasis on preaching, with the sermon normally lasting three quarters of an hour, the rest of the time being taken up with a bible reading, a long prayer and three hymns. Although many non-conformist congregations sang unaccompanied, the hymns at Providence Chapel were accompanied on the harmonium, played for many years by Fred Baldwin and from the 1950s by his 3 sons. The Baldwin family of 7 were the core of the small congregation and once the children had grown and left the village and Fred and his wife moved to Cranbrook, it went into a slow decline being unable to attract or hold younger people. Services became intermittent; until it was only used for the funeral services of old members, the last being in 1979 when it was officially closed. It was sold to a local builder in 1985 and converted into flats.